Stay comfortable, warm, and cozy whenever you wear this personalized hoodie around the house or out on the town. 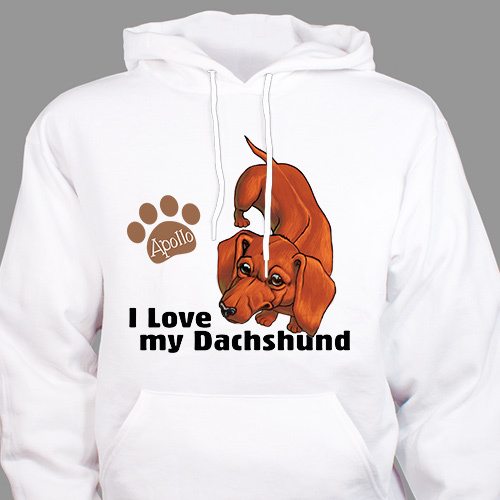 This particular sweatshirt will show off your love for your beloved dachshund in style. The personalized touch on the paw will be a huge hit among your family and friends whenever you wear this item! Our Dachshund Hoodie is available on our cotton/poly blend hooded sweatshirts, machine washable in adult sizes S-2XL. Free personalization of any name is included. Additional Details This is one personalized gift that will make the dachshund owners you shop for smile. Whether the occasion is a birthday or the holidays, this particular hoodie will be a huge hit. Our Personalized I Love My Dachshund Mug is a great gift, too, and it would complement this one well.